To understand money management we must understand risk and to do that we must understand variance and its consequences. 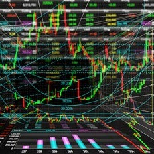 Variance is a mathematical term that is also used in finance and refers to the spread of numbers in a group or population (e.g. the spread of returns from a betting system or the different heights of people in a population). If we perform a run of 1000 bets or trades and the percentage returns are spread out over a large range of values then we have high variance. If, on the other hand, our range of returns are tightly clustered around the mean average then we have a lower variance. The larger the variance the greater there is a chance that returns will deviate (hence the term standard deviation) from the mean. Also, the greater the spread into negative yield the greater the chance of a run of losing bankrolls. In the following simulations we see a variety of variances. The first simulation shows a lot of variance. We can see that there are a roughly equal proporation of winning and losing bankrolls. In fact in this instance the expectation for this simulation is zero. The greater the variance the greater the chance that our bankroll will move into negative territory. We may wish to nullify this by risking smaller amounts or by having a stop loss. Again we have to balance variance (the risk) against reward (the return). We can make a foray into Kelly Criterion by running the same simulation again only using the Full Kelly staking option instead of Level stakes. 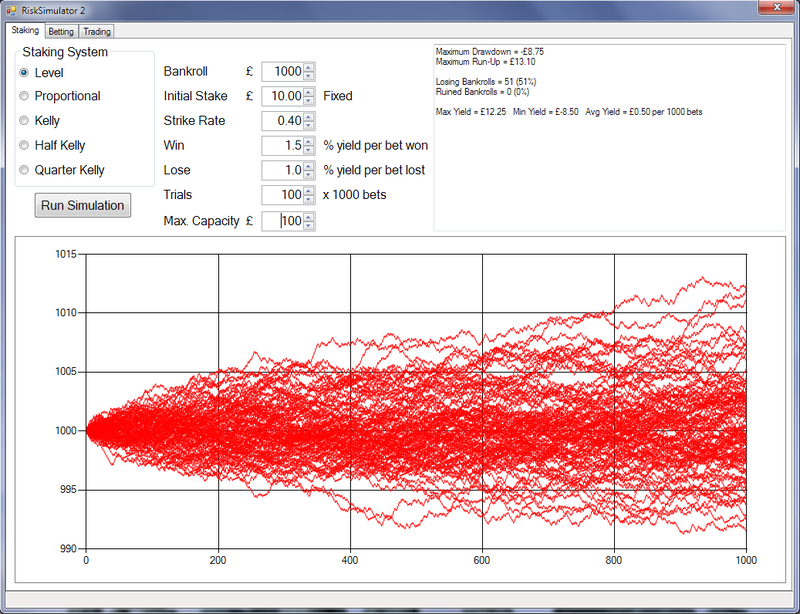 After running the simulation we see that the timeseries for the bankroll has not changed. No bets were placed! As Kelly Criterion is based on expectation then because our expectation is zero Kelly Criterion recommends that we bet none of our bank. We are as likely to lose as we are to win. 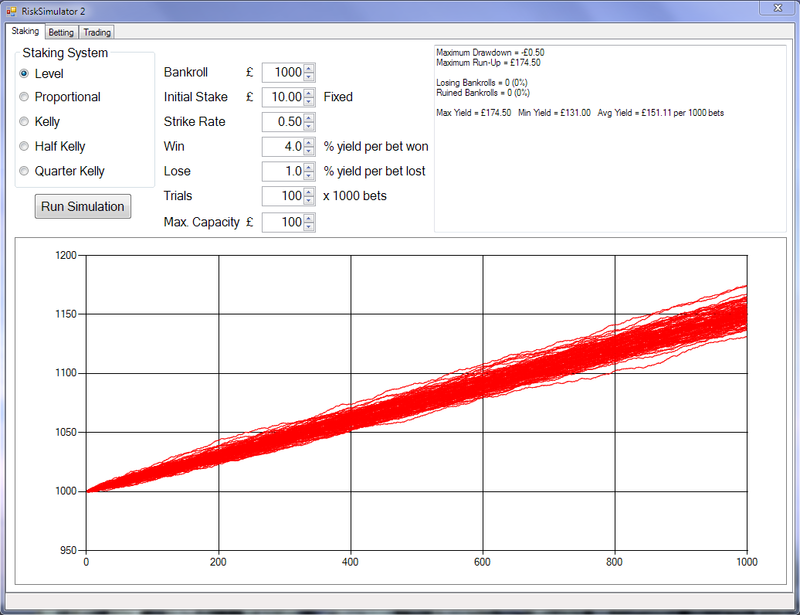 A higher yielding simulation shows a tighter spread of finishing bankrolls. The yield is higher and the variance is smaller. We can make the following conclusions. 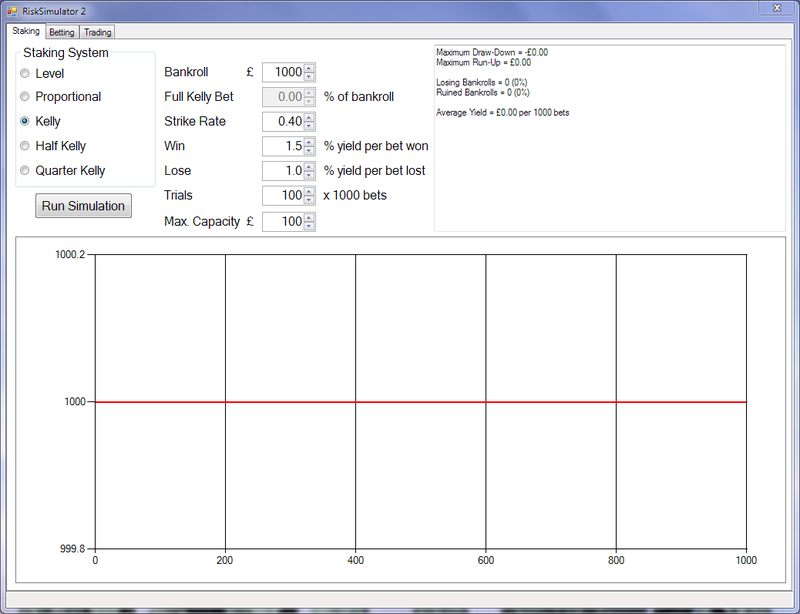 The higher the yield the lower the variance. Strike rate also lowers variance. Next time we shall look at the differences between the various staking systems; fixed, proportional and geometric (Kelly).